This is another dress I swapped on the Swapdom site. I am loving the site. I get to swap, wear, and pass on to the next girl. This time is no different. I'll be swapping this dress and two more items. Please see items below. I had some readers ask me what items I am looking to swap. There's nothing in particular, I'm just always on the lookout for anything cute and that attracts my eye. I can say I do like interesting clutches, midi skirts, and fun jewelry. Also, there are a lot of readers and some of your favorite bloggers on the Swapdom site with lots of fabulous items to trade. When you are checking out my items don't forget to check out all the other plus size items as well. Happy Swapping! For this week's post I channeled my inner Solange Knowles. She is always so gorgeous in yellow. I am usually deathly afraid of yellow, because I consider myself to have a yellow coloring. I'm afraid my color will clash with it, but I'm kind of loving it. Solange and I aren't that far off in skin tone, so I said if she can do it I can too. Style Note: This dress was originally from Ashley Stewart. 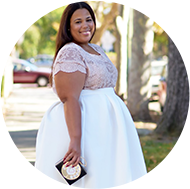 The thing I live about their convertible dresses is that is has a strapless tube top on the top portion of the dress, so you don't have to worry about your wrapped portion shifting and possibly showing unwanted skin. This post was sponsored by Swapdom, all opinions are my own. wouah this dress is amazing ! Girl! I'm afraid... that you look amazing in this dress! Wowza. . . .You look amazing in this dress! When I saw this I said, "wow!" out loud! I think the yellow gives your skin a beautiful warm glow. Gorgeous. lovely and its a great color on you! Wonderful color, you look Fab!! Yellow is such a pretty color. I gives feelings of joy, happiness, and springtime!! That dress is super gorge. I love the look on you! Great stylish elegant dresses for women with very loving colorful. Shop the latest world's largest fashion dress for every occasion. This yellow looks gorgeous on you!!! I absolutely love it!!! I may have to try Swapdom during my shopping ban. you look amazing in yellow! its such a vibrant color and suits you soooo well! I have pinky-pale skin and stay away from yellow. It's a color that a lot of women are afraid to wear, regardless of complexion or hair color. I think this sunny yellow looks absolutely gorgeous on you. It's such a saturated shade, and the styling is pure Greek goddess! It looks great with the plum accessories and lipstick, too. You and that dress though? Amazing. got any wedding invites for spring/summer? this would be awesome to wear. i never think i can do strapless, may have to consider. Yellow is one of my favorite colors. You look radiant and oh so beautiful. Your new skirt looks great on you,and ask you were describing how it wraps around and doubles up.